Duality is firmly established as the industry standard for large-scale professional audio production worldwide. 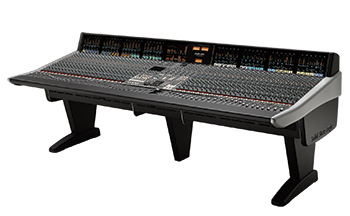 Akin to previous generations of classic SSL consoles, Duality achieves success by enabling engineers and producers to work quickly and ergonomically, as well as delivering superior sonic results. Duality’s innovative hybrid approach has found many fans, by combining a traditional analogue path and signal processing along with exceptional DAW control and integration, all within a single hardware surface. In Spring 2015 SSL released Duality δelta, the next evolutionary step for Duality. The new console marks the introduction of δelta-Control, a completely new analogue console automation platform for SSL studio technology that unites the very best of automation in the analogue console domain with DAW based workflow. Hardware control over two DAWs simultaneously with high speed Ethernet connectivity. 8 group faders and master fader focus, enable you make level adjustments and solos from the centre of the console. New look Channel TFT screens deliver complete optical feedback of channels status, processing, routing etc, and the innovative Eyeconix icons. With channel Autoscan, utilising the welcome real estate of the TFT screens, allowing more than one operator to recall the console. Elegant console project management via a standard computer using the java based SSL Logicitivity Duality Remote Browser. From the purity of your microphone through to creative distortion and all the stops in between through the versatile Variable Harmonic Drive (VHD) circuit. The classic SSL master bus compressor can work in Stereo or 5.1 mode, with useful side-chain functions for complete control. Each channel strip features a compressor/gate, high and low pass filters and EQ (switchable between E/G series curves). Seamless integration with all the benefits of classic SSL analogue console automation and DAW based workflow. The traditional SSL automation system with all of the much loved SSL modes. Unique dual path channel architecture provides unrivalled flexibility for placing processing in the record/monitor paths. 3 stereo mix busses and 24 track busses for flexible routing. Internal busing feature allows patch-free sub groups by allowing channels inputs to be sourced from track bus outputs. Full range of monitor calibration and setup options for today’s surround productions. Available in 24, 48, 72 & 96 fader configurations, expandable in bays of 24 (up to 96) and with producer and patch options. A winged layout for producer/engineers who wish to conduct their DAW session editing/arrangement and audio mixing from a single central position. Reduced overall power consumption demands, minimised requirement for air conditioning and controlled maintenance costs (via standard warranties and available service contracts) all contribute to reduced overall running costs.